One of my favourite emerging traditions (or trends, as it were) for the holiday season is to host a holiday brunch post-present opening. Whether it’s in lieu of a giant turkey dinner with the whole family or a more intimate affair for your household, I love the idea of gathering around and basking in the holiday spirit for a few precious hours after the wrapping is torn off. I chose today’s gifts to either bring with you as a hostess gift, if you’re indeed attending a brunch, or to simply complement your giftee’s kitchen accoutrements for when they host a brunch any time of year. Enjoy! When your mind drifts to brunch you may immediately think of pancakes and bacon, but don’t forget about those savoury side dishes that make this mid-day meal what it is. I’m talking garlicky scrambled eggs, onion-loaded quiche, and seasoned homemade hash browns, to name a few. 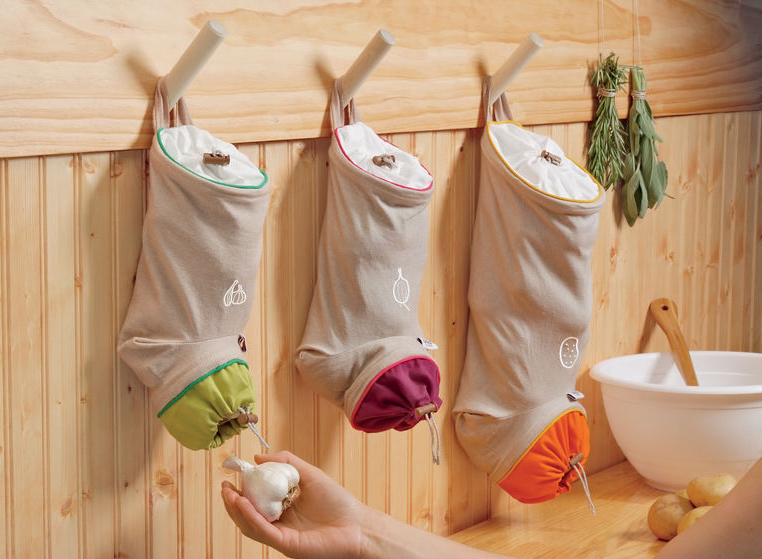 Keep your root veggies from going rotten with these clever ‘keep sacks’ which hang up to save cupboard space. Their ingenious design allows air to flow in but blocks out the light, to keep your most steadfast of ingredients from sprouting. Just like the snowflakes outside, these ones will quickly disappear when you cook up a batch of homemade pancakes for your loved ones. This non-stick griddle pan is easy-as-pie to use. Just whip up some batter and pour it into the molds, set it on your stovetop, and bingo, a plate’s worth of pancakes is ready to serve up. You may never be able to go back to store-bought butter after making it yourself with this simple and charming farmstead-style butter kit. Complete with salts, seasonings, and all the tools you’ll need to make a pound of butter, all you need to do is spring for the cream and soon enough you’ll have butter to spread on your toast, pancakes, and other breakfast sundries come your holiday brunch. Bring it along and gift it to the host, or buy it for yourself and bring some homemade goods instead. True story, it’s rare to find many ‘of the month’ subscriptions here in Canada. But if you’d like to spice up the life of your giftee, you may want to indulge in the ‘Hot Sauce of the Month’ club offerings from saucy supplier From Mild To Wild. Choose your hotness and the length of your subscription, and prepare to scream from the spiciness every single month. Why is this included on the brunch list? Well hot sauce and breakfast have been like two peas in a pod as of late – from sprinkling it onto your eggs to marinating your taters in it, you can liven up any sleepyheads with just a drop or two of these potent tongue-burners. New York-based artist Claudia Pearson is known for her whimsical watercolours, which are used to great effect in this ‘Buy Local’ calendar. The idea? While keeping track of dates, you can also keep tabs on what local produce should be available from your farmer’s market or well-stocked supermarkets. Want to move away from paper? There’s also a reusable tea towel incarnation that can pull double duty as either wall art or kitchen cleaner. I love these glasses because they could be applied to multiple scenarios. Not that big into gift-giving, or are you just dating someone but still want to give your significant other’s parents a present? Consider this an affordable, festive choice. Want to bring a hostess gift for the parents apart from their big under-the-tree surprise? Also great. Did you splurge on a luxe bottle of liquor and want to include an accoutrement? Bingo. As for why these are on the brunch list? Well if you’re going to indulge in a mimosa or sangria with brunch, what better time of year to do it than Christmas? Note that Furbish doesn’t have an official Canadian shipping policy, but does say they do international shipping – just contact their customer service before going for these golden glasses. 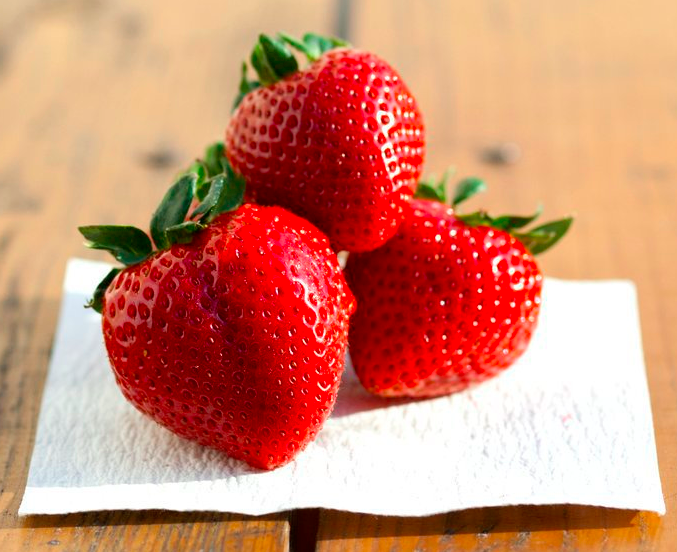 Look below those ripe-as-heck strawberries and feast your eyes on the simplest yet smartest invention (and cheapie gift idea) ever. What is it? Essentially, it’s an organic piece of paper filled with all-natural spices. When you toss it into your fruit bowl or produce drawer – or anywhere you store fruits or veggies – it will actually preserve your fresh food for up to 4x longer. When it’s out of its potent powers (which can be detected by a distinct maple scent), simple compost the sheet and swap it out for a new one. Seeing as how no brunch is complete without a bowl of fresh fruit (and the requisite leftovers), this is an ingenious hostess gift that’s oh-so-affordable. 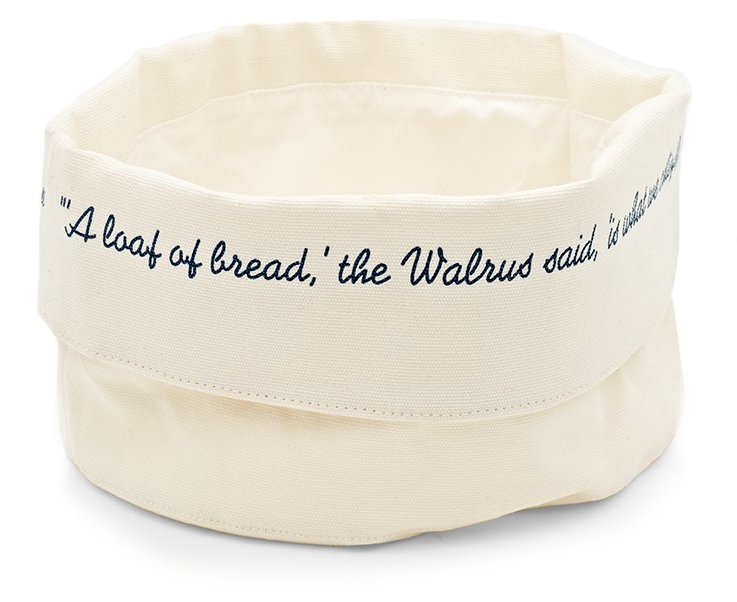 Serve up freshly baked muffins or rolls in this charming literary bread basket, made from breathable, natural canvas and imprinted with a famous quote from Alice In Wonderland. Not only is this a cute addition to your tabletop, it also happens to have a genius practicality about it as well – instead of adding yet another piece of serveware to your already crowded cupboards, this foldable bag can easily tuck in next to your oven mitts, or whatever nook or cranny you’ve got left in the kitchen. Start morning every morning off with a heartwarming beverage and an uplifting message from design star Kate Spade. Each of these crisp, colourful porcelain mugs feature a cheerful affirmation you’ll drink in as you sip your favourite coffee, cocoa, or tea. They may be a little on the pricy side for the full set, but consider grabbing one in your hostesses’ favourite colour for her desk so she can recreate the brunch experience every single day. Consider this your new go-to hostess gift this holiday season. For less than $20, you’ll get a substantial, prepackaged gift featuring organic pancake mix, all-natural strawberry spread, and a bottle of what I consider the world’s most precious liquid, Canadian maple syrup. It’s everything you need to actually get brunch started, and it’s oh-so-yummy to boot! 1) Leave a comment by December 31st with your top brunch-themed pick from this list! 2) Entries are limited to one per person / per email address / per household (or more if you score bonus entries). A random draw will be conducted on or around January 1st to select the winner, who will have 48 hours to respond before another winner is chosen in their place. 4) Bonus Entry: Follow me on Twitter (@cdngiftguide) and send out a Tweet about this contest tagging me in it for a bonus entry! I love those Vegetable Keep Sacks! What a great idea and they look fabulous! I love the BeaverTails Pancake Mix Gift Set! They all look great! I love the variety in the BeaverTails Pancake Mix Set but by the same token, it’s a toss up between that and the Snowflake Pancake Pan from Sears! Super neat finds! The Snowflake Pancake Pan would be such a hot with my grandkids. Neat idea! The Beavertail pancake mix would make a great gift to give or receive! Heading to Winners for that forsure! I love the idea behind Fresh Paper! I really love the Vegetable Keep Sacks . Awesome ideal. I love pancakes for a family brunch. The Snowflake Pancake Pan looks like a great brunch-themed selection. Thank you. I love the Veggie Keep sacks! I think I may have to buy some! I love the snowflake pancake pan! So cute! The Vegetable sacks are cool. I’m notorious for managing to let my veggies rot, so this may mean I actually get to eat some! The Snowflake pancake pan is soo cute. I love the vegetable keep sacks! Making pancakes from the pancake mix in the snowflake pan, how much more perfect can brunch get? Top it off with some fresh blueberries and maple syrup (from the pancake mix set) and we will have happy smiley faces and full tummies all around! I love everything on this list but I’m gonna have to go with the BeaverTails Pancake mix as being my absolute favourite!!! I love the Pancake Mix Set-that would make a delicious brunch with the delicious maple syrup! 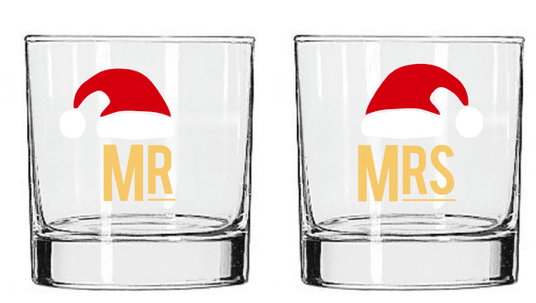 I love the mr and mrs santa clause glasses. very cute. I didn’tknow there were beavertails mix. My kids loves beaver tails! I will be definitely be trying this out! 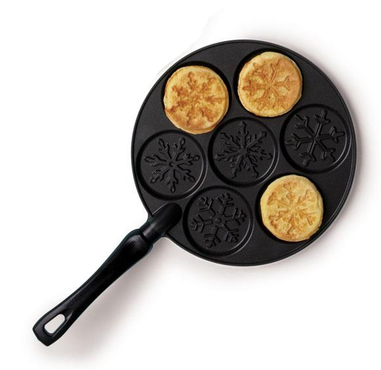 I like the Snowflake Pancake Pan…how cool is that?! The Very Best Brunch http://t.co/GbOmDlJZ via @CdnGiftGuide #win a $75 gift set of goodies from Beavertails!! Awesome. 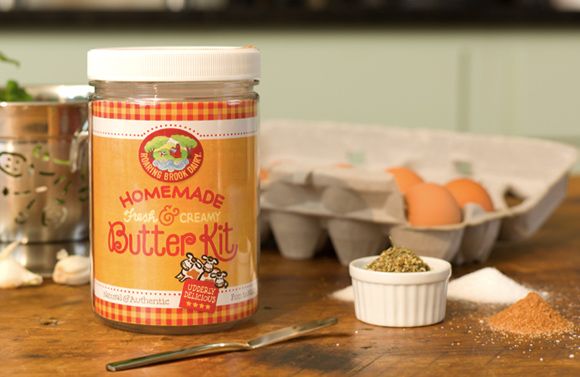 I get all kinds of yummy ideas with the Fresh and Creamy Butter Kit…Yum. I love the Snowflake Pancake Pan! My granddaughter would have a blast having those at grammy’s house! The snowflake pancake skillet is wonderful for this time of year! Following you on twitter as @wendylady75 and tweeted about the contest. I love the canvas bread basket and I’m always up for maple syrop. I like the snowflake pancake mix. FreshPaper- what a cool idea! I love the “Seize the words” mugs…these are a great gift! My top brunch-themed pick is BeaverTails Pancake Mix Gift Set. I love the Snowflake Pancake Pan. I like the Beavertails pancake mix gift set-what a great gift for anyone! I just love the snowflake pancake pan. I may have to get one now. pancake mix with maple syrup. I love maple syrup! I like the Snoflake Pancake Pan – my grandkids would really enjoy the design. The Kate Spade mugs are cute. I love the mr and mrs santa clause glasses. THE PANCAKE MIX WOULD HELP MAKE A GREAT BRUNCH. Th snowflake pancake pan is pretty cool. I really like those vegetable keep sacks! I love the BeaverTails Pancake Mix Gift Set .. this would be a great gift with a basket full of fresh blueberries, raspberries or rhubarb ! I love the Beavertails Pancake Tails Mix Gift Set. It looks yummy! The Snowflake Pancake Pan is adorable! I love the BeaverTails Pancake Mix Gift Set. WE HAVE PANCAKES EVERY SUNDAY SO I LOVE THE SNOWFLAKE PANCAKE PAN AND THE ORGANIC MIX AND SYRUP-YUM-THANKS! The homemade butter kit is my fav. Oooohhhh, LOVE the Snowflake Pancake Pan and the Hot Sauce of the Month Club prize. Can never have enough hot sauce, lol! Mmmmm, the BeaverTails Pancake Mix Gift Set sounds like it would be delish for brunch.,… especially if someone else were to make ’em for me! Lazy brunches are one of the highlights of the holiday season. I like the snowflake pancake pan, we make pancakes all the time here! The beavertail pancake mix gift set looks like a great gift idea. I think I may head over to Winners right now. hot sauce of the month. omgosh hubby would love that. I want the snowflake pancake pan!! I love panckaes!! I like the Vegetable Keep Sacks. I looove the Fresh & Creamy Butter Kit !! I love the snowflake pancake pan. These would be delish! Veggie keep Sacks is what i love! i think the BeaverTails Pancake Mix Gift Set would be an awesome house warming gift! Hi there! I can’t actually control the subscriptions on my site. My best guess is you subscribed to the comments on this post, and not the blog itself. You may want to check your subscription settings on this specific post and not the blog as a whole. If you have any further questions, be sure to check the WordPress FAQ. the Snowflake Pancake Pan is the best! Snowflake pancakes would be great for brunch on a snowy winter’s day! The pancake gift set – my father in law would love it! Definately the BeaverTails Pancake Mix Gift Set..hmm sounds yummy!! My top brunch-themed pick from this list is the “Buy Local Calendar – $24 @ Claudia Pearson”. What a great way to remember what is in season locally. Would make nice framed images as well after the year is over. I LOVE BeaverTails and think the BeaverTails Pancake Mix Gift Set would be perfect for a Sunday morning family breakfast! It was SO hard to choose! However, thinking back to an enjoyable visit to Ottawa, I chose the Beaver Tails Pncake Mix Gift set. I would be so much fun it would be to prepare them on Christmas morning. 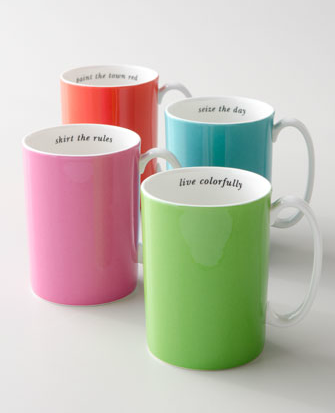 and the Kate Spade Mugs hard to choose just one from this great list!!! I would be equally happy with any of these as a gift! https://twitter.com/Shandon00/status/282651536830652417 Follow you and tweeted! Love the snowflake pancake pan. I think the BeaverTails Pancake Mix Gift Set is awesome. I do love me some panckaes! I love the Snowflake Pancake Pan! Very cute! I love the vegetable keep sacks…what a great idea…and gives a real charm to the kitchen. My pick would be the Fresh & Creamy Butter Kit. I like all the things that are in the basket. My kids love pancakes and the pancake snowflakes would be a nice change for a special winter brunch. The vegetable bags would come in handy at harvest time. too. Hmm, I think the beavertails stuff. A friend of mine tried some and said it was awesome. Love the vegetable keep sacks! I really like the vegetable keep sacks! They are both cute and practical! I would love to have more maple syrup, you can never have too much maple syrup. Hot sauce of the month is the best gift on the list! I like the BeaverTails Pancake Mix Gift Set. My favourite is the Hot sauce of the month club. My brother would love this! The Hot Sauce of the Month Club sounds like more fun than a book of the month club for sure! 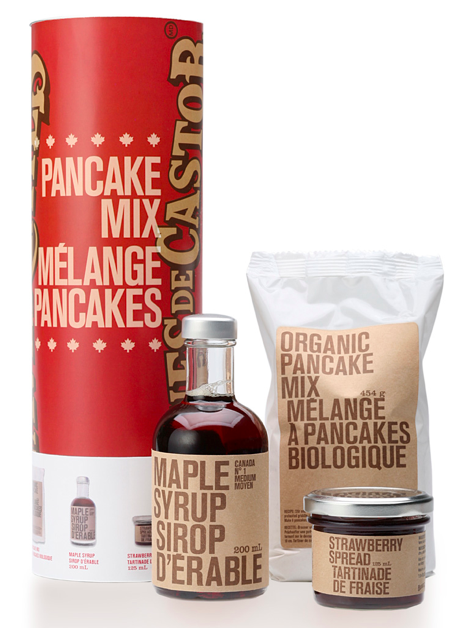 I really like the idea of the BeaverTails Pancake Mix Gift Set….natural and organic…what more could you ask for!!! 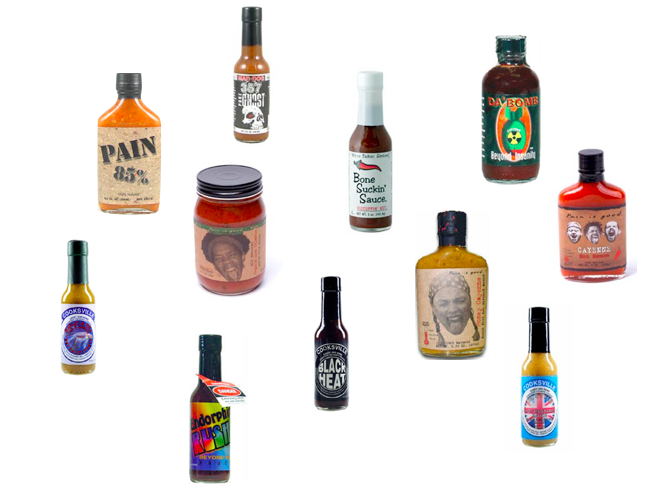 Hot Sauce of the Month kit — how fun!! My favourite is the Buy Local tea towel version! My fave is definately the BeaverTails Pancake Mix Gift Set!! SO YUMMY!! I like the Beaver Tails pancake mix set. It is making me hungry. Love the snowflake pancake pan!